With their full padded seats and a design that places the rider’s legs out in front in a lean back recline position, recumbent bikes are the ideal choice for those with back issues, problems stepping up to high seats or difficulty putting weight on the joints. 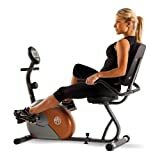 Most people who prefer using recumbent exercise bikes find the angle of their back and legs on an upright bike uncomfortable. There is a variety of models of these types of bikes on the market and in different sizes to accommodate users of just about every size. For some shoppers, features like a large LCD display screen or pulse reader are particularly important, while others may want a simple, no-frills bike. Here is a list of the 5 best recumbent exercise bikes on the market for 2016. 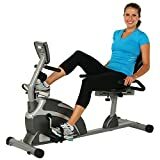 Below we’ve listed and reviewed 5 of the best value for money recumbent exercise bikes, manufactured by well known & trusted brands. 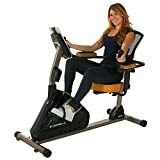 The Exerpeutic 900XL is a recumbent stationary bike that provides an excellent cardiovascular workout while minimizing unwanted stress on you back and joints. It is engineered with precision and incorporates high-quality parts so you are guaranteed longevity to give you value for your money. Tracking your progress is easy with this bike as it features a large, easy to read LCD display that indicated time, distance, calories burned, speed and heart rate information. Moreover, you can easily customize the bike’s resistance and challenge yourself from time to time with the 8-level magnetic tension control system. Moving the bike around your home gym is easy as it has built-in wheels, while extended leg stabilizers are on hand to prevent tipping or rocking during exercise. The pedaling experience is smooth and consistent thanks to the bike’s “smooth torque” cranking system that incorporates a precision balanced flywheel and V-Belt drive. The pedals are big enough and have adjustable straps so you do not have to worry about foot slippage. The Exerpeutic 900XL can accommodate up to 300 lbs of user weight and have ample assembled dimension of 54L x 22W x 34H inches to fit easily into any home gym. 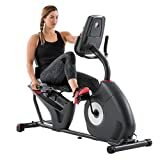 The Shwinn 230 Recumbent Bike was clearly designed for multitasking enthusiasts thanks to its dual-screen LCD console that allows you to track up to 13 different display feedbacks. Moreover, the console features the SchwinnConnect™ goal tracking to set up and track workout time, distance covered and calories burned. All these can be exported to a USB thumb drive and to the SchwinnConnect website for weekly, monthly, and even yearly tracking of fitness progress. The cranking system offers 20 levels of eddy current resistance. The USB port is also good for charging your tablet, Smartphone or other media device during exercise. The large vented seat back offers relaxed body positioning with increased support for the lower back to let you ride while experiencing minimum strain. You can adjust the seat’s incline tanks to the slider seat rail system that has an easy to operate lever system. It has a very stable frame that includes two integrated leveler and center frame support that weighs more than 100 pounds, but moving the bike shouldn’t be a problem since it comes with support wheels. The handlebars are designed to help you get on off and hold an ergonomically placed grip heart rate monitor for comfortable use and acoustic chamber speakers for high-quality audio when you connect your mp3 player. There is also a strategically placed 3-speed fan to keep you cool. This recumbent bike provides the workout you need and it can be easily adjusted to compensate for uneven flooring. Bike assemble may be a challenge for some but the company offers excellent customer support to help you sail through the process with ease. 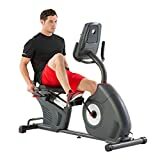 Are you looking for an exercise bike with a compact design that folds up easy to fit in your small home gym, then the Exerpeutic 400XL Folding Recumbent Bike is just what you need. It also features an ultra-quiet double drive transmission system so you won’t disturb your neighbors when you ride. The Exerpeutic model includes their magnetic tension control system to vary your challenges in pursuit of your fitness goals. Tracking progress is easy thanks to the LCD screen that displays parameters such as speed, time, distance, heart rate, and calories burnt. The 400XL has a semi-recumbent design that makes it easier to enter and exit but still stress on your back joints to reduce strain. It has a large seat cushion and adjustable backrest allows you to exercise for extended periods without experiencing discomfort. This recumbent bike is so compact you can fit it into the smallest corner of your home for exercise and fold it into your closet when you are through. It is also easy to maneuver and can handle users up to 300 pounds. One of the unique features sets that this model offers are the counterbalanced pedals that promote a smooth and fluid riding motion. Moreover, the pedals are also fitted with adjustable foot straps to allow them to accommodate different-sized feet. The seat is well padded and comfortable with a reclined back seat. It can be adjusted for stride when changing users to accommodate different leg lengths and ensure continued comfort. You can vary your exercise intensity thanks to the magnetic resistance that offers eight pre-set resistance levels and keeps track of your time distance speed, heart rate and calories burnt via the easy to read LCD console. The bike has a step-through frame design that allows easy entry and exit. It is compact and has built-in transport wheels so you can move and store it away with ease as needed. This bike is a step up from Schwinn’s 230 model. Like the former, it is also fitted with a dual track LCD console capable of tracking up to 13 different display feedbacks at the same time. It also has the SchwinnConnect™ goal tracking feature to set and track work out distance, time and calories burned, and then export them to the SchwinnConnect website via a USB thumb drive for easy progress tracking on a weekly, monthly or yearly basis. However, the Shwinn 270 offers 25 unique resistance levels as opposed to 20 and has 29 preset workout programs with four distinct user settings as opposed to two. This model comes with a USB port for data exchange as well as charging your mp3 player, Smartphone and tablet while you listen to music via the acoustic chamber speakers on the handlebar. The handlebars are also fitted with a cup holder, though flimsy, so you can enjoy your favorite health or energy drinks during your workout. The large vented seat back offers relaxed body positioning with increased lumbar support to let you ride while experiencing minimum strain. You can adjust the seat’s incline tanks to the slider seat rail system that has an easy to operate lever system. You need to read the instructions to assemble the bike correctly and you can adjust the foot pads to compensate for unevenness on the floor. It is compact and can fit anywhere you want to position your home gym.